Humans have a natural dislike or distain for creatures making a habit of dining on living hosts. Mosquitoes, black flies and deer flies are some noted favourites. Leeches also have membership into this infamous club. History portrays leeches as maniacal blood suckers with a lousy reputation tracing their roots back to medieval times where leeches were used for medicinal purposes, a practice that is still in use today. To those who don’t fish the mere mention of leeches brings about involuntary facial contortions and sometimes surprise at their use as bait or imitation when fishing. From a fly fishing perspective leech patterns make ideal searching patterns and are a big fish conqueror. For the neophyte fly fisher leeches are tough to present incorrectly. On stillwaters, leech patterns are a preferred choice during non hatch periods of early morning, late evening and during the summer doldrums. There are over 650 species of leeches worldwide. In excess of 60 species reside in North America. Belonging to the phylum Annelida, leeches are cousins to terrestrial earthworms, night crawlers and the river and stream staple, aquatic worms. Hardy and long lived for the most part leeches inhabit both marine and freshwater environments including, lakes, ponds, rivers, streams, bogs and swamps. Muddy bottomed nutrient rich waters are home to prolific leech populations. Most are aware that leeches can attain large sizes, over 6 inches in some instances. Personal memories including watching an enormous leech in excess of 6.5 inches undulate past my anchored boat one summer afternoon. Its flattened tail was wider than my thumb! From a fly fishing perspective and diet analysis trout seem to prefer leeches under 3 inches long. On average leeches range from 2-4 inches depending upon species. Hook sizes from #12 through #6 3XL are preferred. Other game fish including walleye, pike even channel catfish are all leech pattern candidates. Gigantic horse leeches are favourite catfish bait. In recent years, especially in western Canada, small micro leech patterns have become fly fisher favourites. Leech patterns tied on size 10 and smaller hooks dangled beneath strike indicators work like magic. This catatonic leech presentation is a preferred tactic during the early spring and fall months as trout prowl shallow margins amongst weed pockets and emergent vegetation. The taunting fluttering dance of a suspended micro leeches is often too much for trout to refuse, including those not terribly interested in feeding. Confident swimmers, leeches propel themselves through the water in an extended long, slender pitching motion as their ancestry would suggest, covering about one foot every 2 to 3 seconds. Personal preference involves a slow sinking line to allow a horizontal retrieve path use a slow handtwist or 4 to 6 inch strip retrieve to mimic this open water swimming motion. River dwelling leeches use the current to their advantage coasting and swimming along to their next destination. Dead drifting leech patterns is a little known tactic well worth trying. Fully extended leeches feature a flattened ribbon-like appearance. Their large flattened paddle-like tail drives them through the water at a rhythmic constant pace. 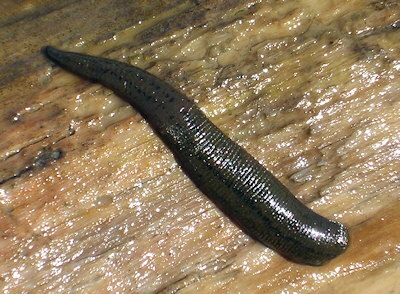 Swimming leeches disturb water as they move. Fly fishers should consider the acoustic footprint of their patterns, particularly during low light conditions when fish utilize their lateral lines as a prey detection method. Bushy patterns such as Wooly Buggers or mohair style leeches that "push" water are excellent low light choices. Leeches also have the ability to dramatically vary their shape. Once threatened, leeches contract their 34 body segments, curling up in compact ball. Foraging trout take advantage of this trait smacking a leech so it curls up for easy consumption. Anglers often refer to this sensation as a short strike. Halting the retrieve and allowing the pattern to fall and fold can be successful in turning short strikes into takes. If this tactic fails continue the presentation. Fish attempting to inhale the leech alter their attack, often slamming the leech from an alternate angle. It is also common for trout to follow a leech through the retrieve, slamming the fly just as the angler lifts the rod to recast. Pay particular attention to the final stages of the presentation to avoid missing following fish. Leeches fall into 3 main types, jawed, jawless and worm. Possessing both anterior and posterior suckers leeches often use these to leapfrog along the bottom substrate and debris, the front sucker is actually their mouth. Many species feature small rasp like teeth used to pierce their victim. Once latched onto their prey leeches release an anaesthetic and an anti coagulant, hirudin, to avoid detection by the host and to aid feeding. This anticoagulant causes leech bites bleed freely once the parasite is removed. Not all leeches are sanguivorous (dining on blood) as most would believe. Most leeches are carnivores, dining upon carrion, snails, insect larvae and nymphs. Some leech species have even evolved to feed on other leeches. Camouflage masters, leeches feature mottled variegated color schemes to match their surroundings avoid predators and to sneak up on unsuspecting prey. Contrasting lighter ventral and darker dorsal surfaces are commonplace although this feature is not a necessary requirement for successful leech patterns. Common leech colors include combinations of olive, brown, black, claret (maroon), tan and dark grey. As a guideline, clear lakes are home to lighter coloured leeches while darker leeches inhabit algae or tannin stained waters. Turning over shoreline rocks and logs is a great way to locate local leeches and identify their coloration. Marabou, grizzly marabou, rabbit fur, emu, long strand Mohair dubbing blends and a variety of chenille’s are ideal choices for animated mottled leech patterns. Leech behaviour including locomotion is arguably the most important trait for fly fishers to focus upon. Mobile patterns that pitch and dance through a variety of retrieves are required for successful presentation. Consider weight location verses quantity when choosing or tying leech patterns. Successful patterns feature weighted front sections using lead wire, beads or cones to pitch and animate the fly no matter the retrieve pace. Although possessing eyes leeches have poor vision capable of only detecting variances in surrounding light levels. This shortfall is compensated through an acute sense of smell and touch. As with many aquatic invertebrates leeches are most active during low light conditions of morning evening or overcast skies. Leech patterns are excellent choices during these times. During bright conditions most leeches remain hidden within aquatic vegetation, buried in the substrate or concealed beneath logs and rocks along the bottom. Leeches also bury themselves into the substrate to escape the ravages of winter. No matter the location, river or stream, lake or pond flies should be presented just above the bottom. Sensitive to concentrations of dissolved oxygen leeches move toward the surface during oxygen poor conditions such as the warm water summer period. As water temperature increases its ability to hold oxygen decreases. This trait explains in part why leeches can be seen moving boldly through the upper water column, a habit that does not go unpunished by opportunistic fish. Nineteenth century meteorologists often kept leeches in jars as an indicator of approaching bad weather. Decreasing atmospheric pressure preceding a low pressure system created a small decrease in dissolved oxygen content causing the leeches to rise up in the jar. Possessing both male and female sexual organs leeches are hermaphroditic but must still mate in pairs, self fertilization is not possible. Mating leeches can be seen intertwined writhing around each other. 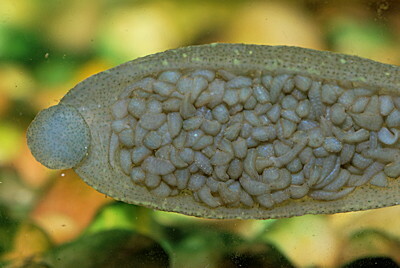 Fertilization takes place within the clitellum, a thicker glandular mid section band of the body. On the leeches earthworm cousins the clitellum is the prominent band located about one third down the body. 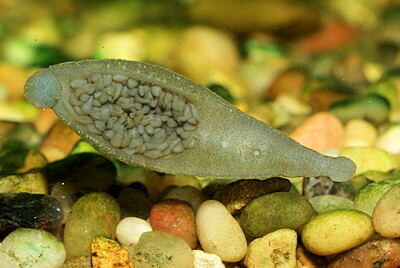 Once mating is complete the leech sheds the clitellum cocoon off its body attaching it to aquatic vegetation or debris. The leeches hatch several weeks later. Some species actually nurture their young providing protection, food and transportation, quite a rare trait in the invertebrate world.